Marvel have announced Wakanda Forever, a three-part comic series focused on the Dora Milaje, including characters like Okoye (played by Danai Gurira in the Black Panther movie). The comic series will be written by Nigerian-American author Nnedi Okorafor and will start in June. In the new series, Wakanda’s fiercest warriors Okoye, Ayo and Aneka leave Wakanda on an adventure that will see them team up with Spider-Man, the X-Men and the Avengers. The Dora Milaje first appeared in Black Panther comics in November 1998 but have become more popular since they were brought to life on the big screen in the Black Panther movie. The characters are believed to have been inspired by an all-female military unit in ancient Dahomey, present-day Republic of Benin in West Africa. The unit was known for fighting colonial French forces in the 1600s but also for warring with neighboring kingdoms and participating in slave raids around West Africa. So you have your favourite Dora Milage alongside Spider-Man, the X-Men and the Avengers fighting against the bad guys. I’m really looking forward to this one which is coming out on June 27. 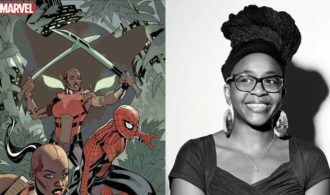 This won’t be the first turn for Nnedi Okorafor to work with the iconic US comic firm. She recently wrote Black Panther: Long Live The King (2017-2018) which was very well received by the comic buying public. You can read more about this new release here.